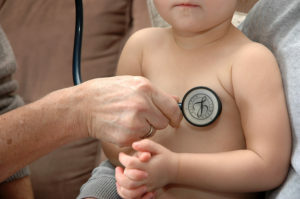 As per Figure 3.11, an incorrect technique is being demonstrated because the stethoscope is placed on the incorrect side of the chest. 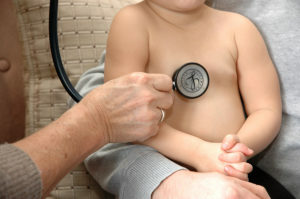 The correct technique (Figure 3.12) to auscultate the apical pulse of an infant is to place the stethoscope at the left midclavicular line in the fourth intercostal space. While taking the apical pulse of an infant, place the stethoscope at the fourth intercostal space at the left mid-clavicular line. Finding the Error Activity: Infant Apical Pulse – Answer by Ryerson University is licensed under a Creative Commons Attribution 4.0 International License, except where otherwise noted.